6 Arguments for Corporate Patronage of the Arts - Why Support Creatives in Your Midst? 6 Arguments for Corporate Patronage of the Arts – Why Support Creatives in Your Midst? No matter how profitable your business, you have every right to question the wisdom of non-core expenditures. Why should you invest in individuals and organizations whose success or failure has no bearing on your bottom line? In short, because not all non-core expenditures are created equal. A growing body of evidence suggests that corporate arts patrons realize substantial indirect benefits from their work, even if their core business activities have little or nothing to do with the creative industries. Let’s examine six arguments for enthusiastic corporate patronage of the arts. Do any convince you that your organization should do more to support creative professionals in your midst? First and foremost, remember the old saw: money isn’t everything. This is not to say that returning value to your corporate shareholders shouldn’t be your top priority. Rather, it’s meant to be taken as a literal statement of fact — that financial ROI is not the only measure of corporate success. You may well find the impression made by your support for the arts to be far more durable than that made by a favorable annual report. Whether your arts patronage strategy focuses primarily on projects devoted to surfacing promising young artists or those promoting established powerhouses, your efforts ensure that the arts writ large remain visible for the next generation of creatives — those whose age and maturity hasn’t yet caught up with their talents and aspirations. Put another way, your largesse ensures that opportunities remain in place as the next creative generation ages into their prime production years — and, hopefully, beyond. Arts patronage is usually just one aspect of a comprehensive corporate philanthropy strategy. In many cases, it’s among the most visible as well. With some forethought, judicious patronage of high-visibility artists and institutions may imbue the rest of your giving apparatus with credibility: that is, if the most publicly visible element of that apparatus is so well executed, the assumption must be that you’ve made similarly wise decisions elsewhere. Perhaps it’s gauche to vocalize, but it must be said: arts enthusiasts tend to be people of some means. Strategically sponsoring favored artists and art houses is an effective means of ingratiating your firm with this community. If arts patrons play to an unusually well-heeled set, they also have unusual visibility in the marketplace. Look at your investment in the next generation of creatives (or present powerhouses) as an investment in maintaining the goodwill your brand has built through other means. If you plan to enter a new geographical market in the near future, consider announcing your arrival with targeted sponsorships. Revealing yourself as an enthusiastic patron of the arts before you’ve made a single sales call in the market ensures you’ll have ample goodwill — and name recognition — when you choose to do so. Who Are You Supporting This Year? 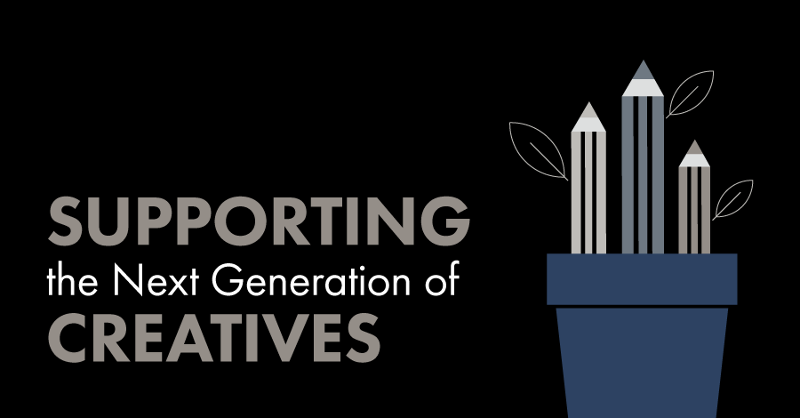 If you’re newly convinced that supporting creative professionals is the right moral and bottom-line decision for your business, there’s only one question left to answer: who will you be supporting this year? Your generosity is too important to distribute lightly.